We recently got to work with the Sustainable Merchandising class at the Fashion Institute of Technology on a class project. While we like to think it was a great learning experience for the students, who are we kidding, we learned so much from them! We got some fresh new ideas for our upcoming season. 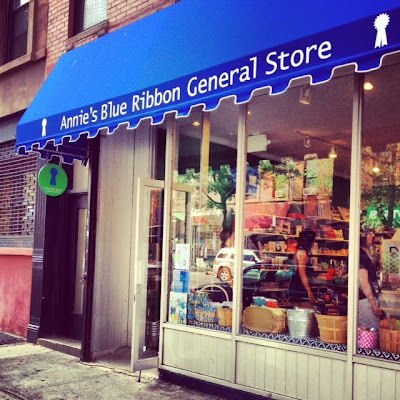 We were also excited to work with their Professor, Ann Cantrell, who has a background with some major fashion brands and in recent years has made her dream come true..she's opened Annie's Blue Ribbon General Store in Brooklyn, a perfect spot to shop for holiday goodies and ethically-sourced products. 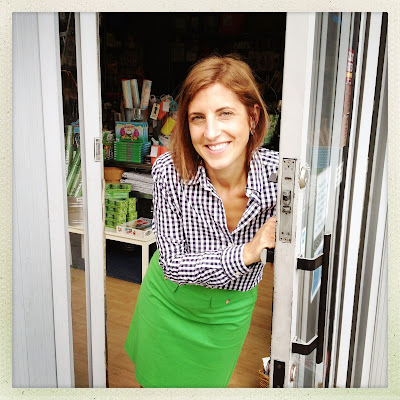 Ann will be guest blogging on a variety of sustainability topics for us, so get excited! 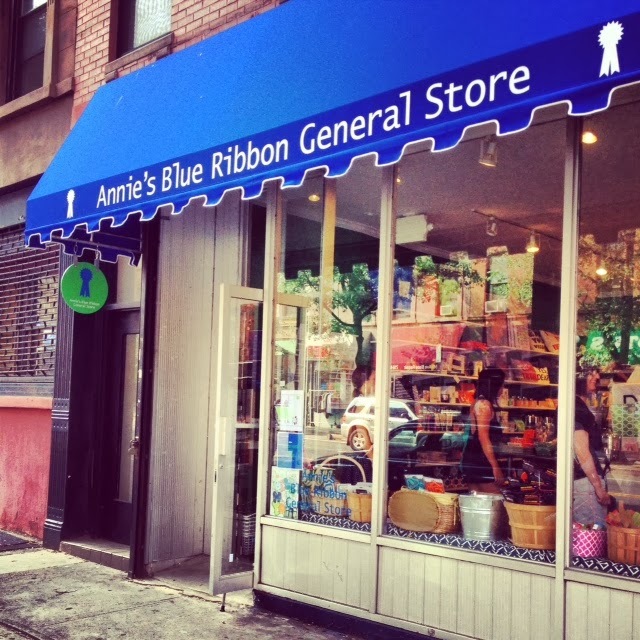 What inspired you to open Annie's Blue Ribbon General Store? I always loved going to General Stores growing up. Whether it was in the back roads of Vermont, or where I grew up in rural NJ (my husband says I grew up "off the grid" before there even was a grid) I loved exploring them for all their interesting and quirky offerings. I was intrigued with the idea of a place where the whole community would shop for everything they needed. After college I did a lot of traveling and discovered a gem of a shop in Sydney, Australia called Remo General Store. Sadly it is no longer around, but it was a huge inspiration for me. Same with Alley's General Store on Martha's Vineyard. I still visit that amazing store as much as I can! What do you look for a in new products that you're bringing into your store? I love finding new products for the store. It's still such a rush for me, and I get so excited to show customers our cool, new offerings. I look for fun and functionality in whatever we buy. If people ask for alarm clocks, or picture frames, I look for unusual and interesting options. I also am drawn to good design and clever packaging. I'm a sucker for good packaging, but the products have to work well too. I have a certain target customer in mind when I buy, but we also have people of all ages & backgrounds that shop at the store, so I am always pushing myself and my team to find new things no one has seen before. How do you think the values of your consumer have changed over the years and have you had to adjust your product offering? We have been open now for six years and I am constantly learning from our customers. 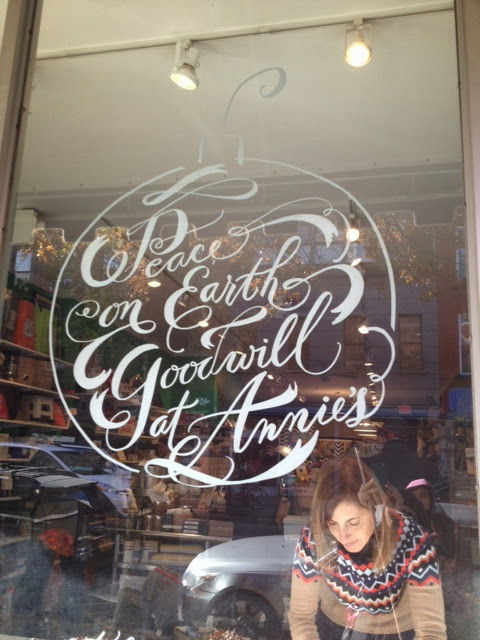 We are in Brooklyn (although we sell all over the world through our website) and our customers are hip, highly educated, well- traveled and extremely conscious of the environment. We keep looking for new products to meet all these criteria, but the number one issue I have seen over the past few years is an increased interest in sustainable products. Eco friendly materials, ethical production, re-usable, reclaimed, recycled are all factors we look for in our products, as well as locally made or made in the USA goods. What are some hot selling items this holiday season? This Holiday we are selling all types of good stuff! We have these lovely soy candles from Apotheke that are made in Brooklyn- my favorite is Woods (smells soo yummy!). Another best seller is our awesome Vinyl Puzzle- literally a puzzle of someone's cool record collection. The puzzle is made in the USA with recycled cardboard on recycled paper and with soy inks. Another favorite is this awesome set of magnetic blocks for kids. This is perfect for parents to keep in their diaper bags or handbags for restaurants, plane rides- anytime your child needs some serious entertaining on the go. They are designed in the USA, purposefully made in Honduras, made from eco-friendly, FSC-certified Honduran hardwoods. Safe, non-toxic, water-based lacquers (for colors and clear coats) and the pouch is industrial felt. You moved recently? How can it be accessed by public transportation? After six years on a lovely corner of Boerum Hill, Brooklyn we moved to Park Slope this summer. I love that we moved (and run our business) completely without a car. I walk or take public transportation everywhere. We are near the R train to Union Street, or a short walk from the 2,3 to Bergen. We are on 5th Avenue and there are a ton of other great stores and restaurants (and bars :) in the neighborhood, come by and see us! How did you come to teach a class at FIT? A fellow Professor found me on Linked In (a shout out for Social Media), and contacted me. I started as an adjunct and then just started teaching more classes that fit my background and I was hooked! I love working with the students, teaching and being around like minded people. What was the focus of the class and did your reach your goals for the semester? FM326 Sustainability in Fashion Merchandising is one of my favorite classes. In other classes at FIT the students learn about "fashion fashion" and "speed to market" and in this class we totally turn this line of thinking upside down and talk about ethical supply chains and what retailers can and should be doing to help the planet. We talk at length about the mindset change that needs to happen for consumers to help turn the table on what is happening to the environment as a result of the years of abuse from the fashion industry. Part of the class is a research project with a partnership with a sustainable company. This semester we were lucky to partner with Loomstate, helping them with four different projects they proposed. After working on the projects in teams for months, the students presented back to their Loomstate mentors last week and it was really amazing to watch. I was truly blown away by the knowledge the students gained on a wide variety of subjects- from presenting a full blown marketing strategy for Loomstate's target customers to proposing ideas for new B2B partnerships and much more. The students told me how much they learned this semester and how they will incorporate this knowledge into other classes, the fashion industry itself and their own lives. It was a great semester! Is sustainability of growing interest at FIT among faculty and students? Yes! I feel like awareness of these issues on sustainability are growing every year from both students and faculty. I just joined the President's Council on Sustainability on campus and am excited to become a bigger part of FIT's sustainable mission which is now incorporated into the college's Strategic Plan as well. We have reduced our Greenhouse Gas emissions by over 40%, met the Mayor's challenge in doing so as well as have completed several other eco- friendly projects including a 13,500 foot Green Roof on one of our major buildings. It is still a constant challenge to keep getting the word out though. With that being said I hope everyone comes to our 9th Annual Sustainability Conference on April 8th, 2014. We have a lot of engaging speakers lined up revolving around the theme of "People, Planets and Prosperity: Measuring our Impact". Robert F. Kennedy will be the Keynote speaker, and we will also have some interesting breakout sessions too, hopefully including one with Rhett and his FIT Research Team on Organic Cotton Production in the USA. Why partner with Loomstate for the semester? Loomstate is doing amazing things for not only their own business and partners but for the whole sustainability movement. I was honored to partner with them this semester and I know the students got soo much out of the research they did. They realized the work they were doing had real world impact on the revolutionary contributions Loomstate is making in the world of sustainable apparel. Do you have a favorite food over the holidays?